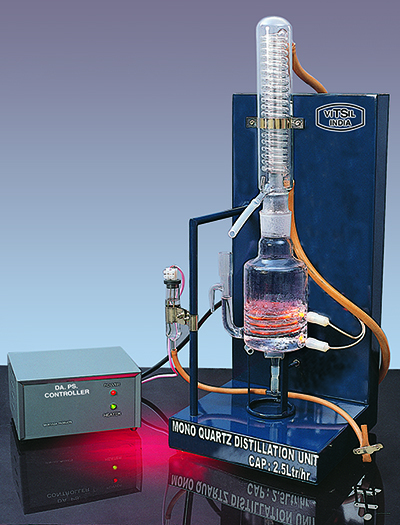 VITSIL mono quartz distillers being very compact and the construction material being high purity quartz, it meets the standard of the analytical laboratory where purity of distilled water free from metallic ions and bacteria is criteria. The boiler is made of high purity quartz and the condenser is of borosilicate/quartz material. The built in heater provides from minimum loss of heat and production of distilled water in 2-3 minutes. The unit is mounted on a powder coated metal stand with Electrical connections and is easy to dismantle and assemble the unit. Fibre glass insulated wire and silicone rubber boot resists high temperatures. Distilled water output is immediate. Pyrogen free, free of heavy metals. Can be easily converted to bi-distillation apparatus. Powder coated stand for rust free operation. Note: Distilled water is free from ions and bacteria. Hence it is difficult to measure pH and conductivity values. Distilled water conductivity will be less than 2 micro siemens for units with quartz condenser. Quartz receiver 2 liters capacity with stopper and stopcock.